All the best mattresses priced at thousands of dollars feature a top layer of memory foam, a visco-elastic Space Age material that resists the forces of gravity even when you sleep. “Memory foam” has become a generic term in the sleep industry and the big players have taken the technology and used it to create their own proprietary mattress and pillow products. Companies like Serta, Tempurpedic, Select Foam, and Beautyrest all build mattresses and mattress toppers using memory foam science. 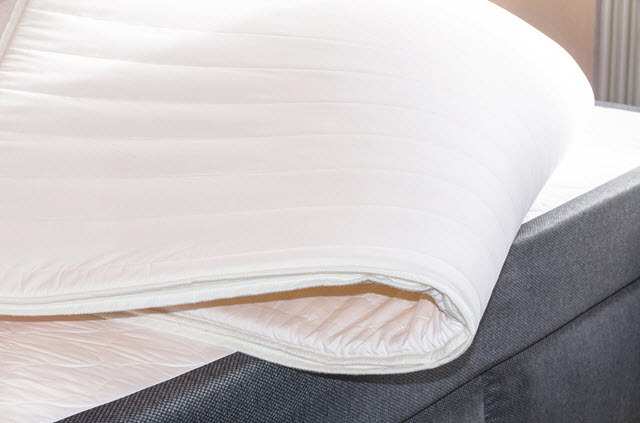 Unlike traditional inner spring mattresses with their padded foam and fabric support layers any mattress constructed of memory foam offers a much denser comfort layer that conforms more efficiently to the curves and physical contours of your body and responds to temperature, a unique feature of this material. These products are designed to provide higher levels of sleep comfort because they relieve stress and strain on your body’s key pressure points. When you can’t invest in a whole memory foam mattress—some of them run thousands of dollars—and your mattress is in good enough condition to serve as a supportive and quality foundation, consider the value available in a memory foam mattress topper. Mattress toppers are simply a layer of foam material designed to fit various traditional bed sizes. The old school bed toppers were commonly known as “egg crates” and offered nothing more than a layer of plain foam that would discolor and actually disintegrate over time. Thickness is the actual measurement of the layer of foam product. This is often an indication of value, but you must consider “thickness” with weight and density. Thicker when combined with a mid-range density, such as 4 lb, is simply a more opulent experience. Common mattress topper thicknesses are 2 to 3-inches. Weight and density are key factors in buying a memory foam topper. Density denotes the softness of the foam and weight the heft, but they really work in tandem. Cheaper foams – those under 3 lb in density -- are softer but they are also less valuable than the heavier/denser foams. Four and 5 lb density toppers are mid- and upper-range memory foams and provide some of the better comfort and support, though you’ll pay more. Buy brand-name. This last rule is really intended to keep you from ending up spending money on poor quality memory foam, fake foam fillers and market “seconds,” or manufacturing mistakes that often end up on clearance shelves. Stick with the name brand companies like Tempurpedic, Serta and others when buying memory foam mattress top layers.